Get to know the woman who's brought the Spa City's wedding dress game a cut above the rest. 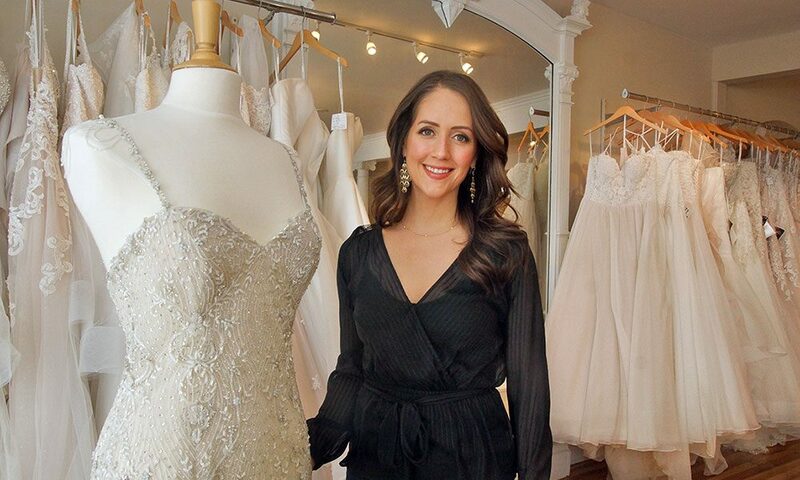 Saratoga Springs’ bridal boutique, Lily Saratoga, has actually been a fixture in town since 2004, with current owner, Laura Mullen, taking over in 2014. Laura, who got her start in the jewelry business at Frank Adams Jewelers, is now helping make brides’ dreams come true with a selection of the finest wedding gowns, bridesmaids attire, bridal accessories and more. saratoga living recently had a chance to talk with Laura about her business—and what it means to be located in the Spa City. How did you get your start in the bridal industry? I actually got into the bridal industry by way of the jewelry industry. I started working at Frank Adams Jewelers in 2008, after graduating from Union College and giving the corporate world a try. I started at Frank Adams as a part-time Sales Associate, figuring that it’d give me some time to figure out what I wanted to do with my Psychology degree. I ended up discovering that I really loved working in fashion and for a smaller, family-owned business. One of my favorite areas on the sales floor at Frank Adams was the bridal counter. There is so much emotion, energy and trust that goes into the purchase of an engagement ring. I found myself truly connecting with my bridal customers, first with the person purchasing the engagement ring, and later with his or her fiancé or fiancée when he or she came back for wedding bands. I loved hearing the details of their wedding and getting to know the couple. I even got invited to a few of their weddings! It was around this time that I met Maureen Donnally, one of Lily Saratoga’s prior owners. I actually helped Maureen’s son-in-law pick out her daughter’s engagement ring. Maureen had such a passion for brides, wedding dresses and weddings in general, and worked so hard to bring that passion to her business. We collaborated on a few other projects together and became friends. Maureen called me in the spring of 2014 and asked me to meet her at Lily’s. I had no idea what she wanted to discuss, so I was completely floored when she asked me if I would be interested in purchasing the business that she and her partner had owned for 10 years. I’d never thought to myself “I want to own a bridal shop,” but I knew, without a doubt, that it was the right decision to make. I proceeded with writing a business plan and getting a bank loan and on October 30, 2014, I purchased Lily Saratoga. What makes Saratoga Springs such a great place to run a business? I feel so fortunate to own a small business in a “destination wedding town.” It’s truly amazing the number of beautiful wedding venues we have here in Saratoga and the surrounding towns, as well as the number of incredibly talented vendors. Because of this, our town has such draw to out-of-staters, as well as brides who grew up in Saratoga or went to school around here. Saratoga also offers so much character, charm and history. I’m fortunate to be in a space that many consider one of Saratoga’s gems. Lily Saratoga is housed in a beautiful yellow Victorian that dates back to 1840. The boutique is warm and inviting, with tall ceilings, beautiful crown molding and Victorian accents, and bright, sunny windows. The history and charm of the boutique really add to the shopping experience for our brides. Tell me about one of your favorite customer interactions. There are honestly so many to choose from! We get to be a part of a really special time in people’s lives, and brides and their families are happy and excited to be shopping with us. Being a psychology major, it’s always interesting witnessing the dynamics between the bride and the guests she brings with her to shop. Every situation is a little different, and my goal is always to figure out how to best help a bride find exactly what she’s looking for. One of my favorite things is witnessing a bride get in to “the one,” before she realizes it is. Her body language shifts, she stands taller and you can tell that she genuinely feels so beautiful in the dress! What sets Lily Saratoga apart from the other bridal companies in the region? We have friendly competition with a few of the other bridal boutiques in Saratoga and Albany, and I think it actually works to benefit all of us. Brides are able to make a day out of shopping for their wedding dress in Saratoga, as they usually make appointments with us and the other local boutiques. It’s nice, because it keeps brides local, and they don’t feel the need to travel to New York City or Boston to find what they’re looking for. It also attracts brides from surrounding areas like Vermont and Upstate New York. I think all of the boutiques carry something a little different from the other. Since I’ve purchased the shop, I’ve focused on expanding our designer collections and bringing a little more variety into Lily Saratoga. Our environment’s also something that sets us apart. We always try to make it an enjoyable, pressure-free and memorable shopping experience for the bride and her family. As our tagline on our website reads, we are a “boutique bridal shop in the heart of Saratoga Springs.” I feel blessed to have been given the opportunity to work in such a special boutique with an amazing group of women. We love what we do and are passionate about connecting with brides and making their wedding dress shopping experience special. What impact do you hope your business has on the Saratoga community? Lily Saratoga has been a bridal shop for 14 years now and has grown significantly over the past few years. We had 215 brides purchase their wedding gown from us last year, which was an increase of about 40 percent since I purchased the business in 2014. A lot of the growth comes from our increased presence on social media as well as an increase in the variety of styles offered. We’re able to attract brides from out of town, who also love being able to spend time in our charming community. Anytime we have a bride from out of town, we always refer them to one of our favorite spots to eat and help them celebrate with a cocktail! I’m sure a lot of local business owners would agree that with growth, it’s also important to maintain the traditional and small-town feel that so many shops, restaurants and spas have here. I’m very driven to try to maintain the great reputation that the previous owners built for Lily Saratoga, which came from their hands-on approach and commitment to customer service. Though we have seen an increase in traffic from out-of-town customers, it’s really the locals that help to support us the most. It’s so endearing to hear about a bride whose older sister shopped with us, or whose mother purchased her gown from Trousseau, which was the shop’s former name back in the ’90s, I believe.